The battle for Haymaker Forest is now entering its fourth year, here in the second half of summer, 2018. 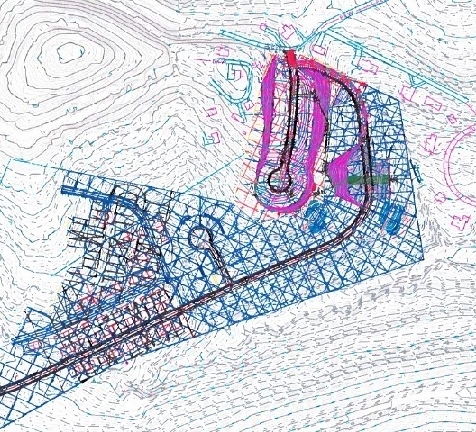 Over the course of months, MUB drew up and released the plans to the developer. None of this was known or reported publicly except by concerned residents who filed Freedom of Information Act (FOIA) requests of MUB, the city, and elsewhere in a determined effort to find out what was going on, and who knew what. Fortunately, the next major victory in the battle for Haymaker Forest had culminated almost exactly one year prior to the first bulldozer grinding into the forest: Morgantown city election day in April 2017, when two of the three City Councilors representing city wards bordering Haymaker Forest, who had moved ineffectively or not at all on saving the forest, were handed two huge defeats. Councilor Redmond and Councilor Bane lost in a landslide to Mark Brazaitis and Rachel Fetty, who gathered the second highest and the highest number of votes of all the candidates. The battle for Haymaker Forest fueled that entire city election. People from many backgrounds did a lot of work, in particular Bernie Sanders supporters. And the people who had been working and turning out to help save Haymaker were as actively involved as anyone. Mark Brazaitis had made a centerpiece of his campaign the preservation of Haymaker Forest – the only way to protect the wildlife, ecology, and environment and to preserve the quality of life of the adjacent neighborhoods and of the city and county in general. He called upon any and all entities, private and public, to act to preserve this local community forest facing imminent destruction. During one effort to secure funding, in fall of 2015, concerned residents proposed that the City Council dedicate a portion of the soon-to-be-voted-on User Fee to permanently fund both green space acquisition, such as Haymaker Forest, and ongoing BOPARC activities and infrastructure. This made some minimal progress with the City Council at that time, before being entirely dismissed. Not so much as a cent would go to green space. Much else was considered and explored from then on, with no funds ever being secured. From the unsuccessful but strong public requests and proposals to City Council (and other public agencies) to buy and protect the Haymaker Forest for the public in the fall of 2015, to the great public turnout at the city’s Planning Commission meeting in May of 2016 that successfully blocked temporarily the proposed new development, to the sweeping success of the April 2017 City Council elections that removed the 3 councilors most opposed to any forest purchase and brought in at least several strong advocates for its purchase, to the remarkable summer of 2018 City Council plans and proposals for a green space acquisition referendum and City purchase of the forest for the public, to the ongoing negotiations between the City and the current forest owners to save the community forest for the public once and for all, the battle for Haymaker Forest has proven to be the proverbial long and winding road. If we can’t save the forest, we can’t save ourselves. If we can’t save our parks, we can’t save ourselves. If we can’t save our neighborhoods, we can’t save ourselves. If we can’t save our libraries, we can’t save ourselves. If we can’t save our sidewalks, we can’t save ourselves. If we can’t save Woodburn schoolgrounds, we can’t save ourselves. If we can’t save Krepps pool, we can’t save ourselves. If we can’t save our roads, we can’t save ourselves. If we can’t save our trails, we can’t save ourselves. If we can’t save our public services, we can’t save ourselves. If we lose a car dealership, because it doesn’t like to be annexed into the city to pay city taxes like every other business in the city, who cares? We haven’t lost anything. We can go to another car dealership. Or another car dealership will move in. If we lose a car dealership, we haven’t lost anything. More importantly, we haven’t lost ourselves. If we lose a restaurant, because is doesn’t like to be annexed into the city, who cares? Another restaurant will move in. Probably a better one! If we lose a restaurant, we haven’t lost anything. More importantly, we haven’t lost ourselves. If we can’t annex, we can’t save ourselves, we can’t know ourselves, we can’t grow ourselves. If we can’t save the trees, we can’t save ourselves. If we can’t save our wildlife, our ecology, our environment, we can’t save ourselves. The air in Morgantown is polluted enough already. Why would we want to make it more polluted downtown by removing the great pollution filter that is Haymaker Forest? If we can’t save Haymaker Forest, we can’t breath as well. We can’t save ourselves. If we can’t save the community park that is the forest, if we can’t save the pure West Virginia hollow that is Haymaker Forest, we can’t save ourselves. If we can’t save our neighborhood services and structures and parks, we can’t save ourselves. If we can’t win the Battle for Haymaker Forest, we can’t save ourselves. That’s why all this matters. If we can’t save our communities, no one else will. If we can’t save the forest, we can’t save our communities. If we can’t save our communities, we can’t save ourselves. If we can’t save the trees, if we can’t save Haymaker, if we can’t save this wild and wonderful little piece of the planet, then we can’t save ourselves. That’s why all this matters. We are trying to save ourselves here, folks. Here and now. Let’s bring Haymaker Forest back to a vote. Let’s get Haymaker Forest back. Let’s end the postponement. Let’s vote! If we can’t save Haymaker Forest, we can’t save ourselves. The local historical and political magnitude of the ongoing battle for Haymaker Forest is probably still too little understood. It began in the summer of 2015 when a local resident found a map on the edge of the woods dropped by a land surveyor. The engineering map depicted a massive new development located mostly in the county but also in the city that was designed to stretch from Dorsey Avenue at the boundary of Morgantown’s 1st Ward, running along a thruway with multiple spokes past the entire top of Morgantown’s 2nd Ward, over to Morgantown’s 6th Ward, with the thruway exiting in the city on Buckhannon Avenue where upper South Park neighborhood meets South Hills neighborhood, not far from Southpoint Circle neighborhood. Again, this was summer 2015, three full years ago. Prior to being presented to City Council, three Neighborhood Association Presidents signed the Position Paper, and two attended the City Council presentation: Bill Wasson, President of Southpoint Circle Neighborhood Association, and Paul Steel, President of South Park Neighborhood Association. The third President, Dave Harshbarger of South Hills Neighborhood Association could not attend and eventually appeared at a subsequent City Council meeting where he appealed to the Council to preserve Haymaker Forest. It soon became increasingly well understood that while the land remained privately held, by all appearances it had been abandoned by its owners. Haymaker Forest had long since been outfitted with complex trails and had long since become a community park, a community forest, of the residents of the multiple surrounding city neighborhoods and city wards and nearby urban county pockets. In fact, nearly half of the city wards, 3 of the 7, border or contain Haymaker Forest to a significant degree, as do the homes of nearby county residents. People from all these neighborhoods had been using the forest as a community park for decades. Despite the public appeals (both formal and informal of the three city neighborhoods and other residents) to protect this cross-border forest in accord with popular concerns and quality of life values large and larger – and very much in accord with the highly detailed land management and conservation maps in both the City and County Comprehensive Plans – nothing was attempted by the County, and the efforts and achievements of the City were limited, at first, to protect Haymaker Forest. Until things changed. Remarkably, after the multiple communities’ self-generated initial strong efforts in the summer/fall of 2015, the public managed a series of impressive achievements over the course of the next two and half years, with three major turning points: the first in the spring/summer of 2016, and then again in 2017, and finally another huge push in 2018 during recent months. These further historical moments will be detailed in a subsequent post, to bring the long road and the ongoing history of the battle for Haymaker Forest to its current point. In summary, the total value to the Morgantown and Monongalia County community of an undeveloped, protected Haymaker Forest greatly outweighs the value of development. Not only is this clear today, when Morgantown is growing rapidly and losing much of its natural qualities, but it will be even more obvious in coming years, when population and environmental pressures will be magnified due to climate change and human migration to water-rich areas. Securing the Haymaker Forest for public use and protection makes both short-term and long-term economic sense. Likewise, Morgantown and Mon County residents and visitors will enjoy its incalculable benefits—as a recreation area, as a place of refuge within a busy city—today, tomorrow, and forever. Today on WAJR, the morning show hosts expressed if anything a surprised reaction (“hmm”) to a caller telling them that the hockey team helped build and pay for the BOPARC ice rink, and that WVU contributed to a room in it, and that donations came from Jack Roberts’ sister, and that Jack Roberts donated the park to BOPARC and the public in 1st ward neighborhood. Surely the hosts did not miss that all such funding now is flooding out of the neighborhoods and out of the city park system into Mylan Park where no one lives. Another caller stated that WVU originally said its rec center would be open to the public but then had to disallow that when it feared losing its non-profit status. This is how to make Morgantown poor. This is how Mylan Park makes Morgantown poor. Major private donations and WVU funding and grants that previously went to the area’s major city park system, spread widely through all of Morgantown’s neighborhoods and near densely populated urban county developments, all those millions and tens of millions of dollars now go primarily to Mylan Park where virtually no one lives, far from the many neighborhoods. This is a recipe for further city blight of infrastructure, lack of green space and wellness activities, increased social and community decay, and the collapse of urban livability. Where is a YMCA or other rec and wellness center for any of the city neighborhoods? Fairplay, Colorado, a crossroads town of 760 people, using two bonds, built a remarkable multi-million dollar year-round indoor water facility, community and wellness center on a scant few acres. Where is a similar center for the Woodburn schoolgrounds? No, you can’t have it. Not the neighborhoods, not the communities. But Mylan Park can have it, a private entity, funded by wealthy donors. The city where tens of thousands of people live is instead gutted, made poor. Monongalia County doesn’t even have a park system, not one single facility, for its tens of thousands of urban county residents around the fringes of Morgantown, Star City, and Westover. It has three parks for its many rural residents but nothing nearby for its urban residents in the many crowded housing developments of greater Morgantown. And the county pays virtually nothing ($50,000 this year) of the several million dollar budget of Morgantown’s city park system, BOPARC, even though half of BOPARC users are from outside the city. (Yes, there is a $2.5 million county levy to repair the BOPARC ice rink, but city residents are taxed for that levy too, just like any non-city resident). This is how the city of Morgantown is made poor. Mylan Park makes BOPARC poor. Private, state, and county dollars that formerly would go to the many BOPARC green spaces and facilities and trails throughout the city neighborhoods, including near densely populated county areas, now go into the no-man’s-land of Mylan Park. Monongalia County has committed $150,000 to Mylan Park – a private entity – while supporting BOPARC to the tune of a mere $50,000 – a public entity. All the while, Monongalia County has no urban county resident park system, at all. This is how Morgantown and the greater Morgantown area is made poor. And then there is annexation and the longstanding record of wealthy entities and the County Commission’s open hostility to the City of Morgantown expanding to encompass all the urban residences and urban commerce surrounding its borders. These people and business benefit from city-based consumption and from city structures and planning and services while not paying any of the taxes (B&O and property taxes) to the city that actually sustain the conditions off of which the businesses profit and the urban county residents use and enjoy. This is how Morgantown is made poor. This is how the city Park System, BOPARC, is made poor. And urban county residents suffer too. The whole region suffers. WVU has its own rec center for its students and faculty, and some shared public green space and facilities, if you can afford them, but this does not remotely compensate for what Morgantown’s BOPARC system and rail trails and neighborhood parks offer – largely free – to virtually all WVU employees, families, and also students, often right in the communities where they live. How much does WVU support BOPARC compared to the use of the system by its employees and students and its value to them? How much does Westover and Star City support BOPARC compared to the use of the system by its residents? How much does the county support BOPARC compared to the extremely heavy use of the system by the non-city residents, especially its urban county residents who have no neighborhood park system of their own? The park systems of Star City and Granville and even Westover and the Brookhaven and Cheat Lake urban populations (let alone the non-existent park system of the other urban county residents flooding all around Morgantown’s borders), these systems or facilities do not remotely compare to the amenities offered by Morgantown’s BOPARC system with its pools, skate park, rail trails, tennis courts, ice rink, and so on, even in their currently impoverished state. And what do these population bases pay into the BOPARC system that they use heavily? The County should correct this inequity. $50,000 doesn’t cut it. Chump change. It’s scandalous. This is how Morgantown is made poor. This is why a county BOPARC levy is needed immediately this November, and not at the next opportunity two years from now during the next election. Otherwise, we’ve all been cheated of our chance to decide for ourselves, yet again. And the County – which should provide a dedicated funding stream for BOPARC independent of any levy – would be derelict again. Does the County want to see that the City gets what it needs? Even has a chance, via a referendum for a levy, to get what it needs? Or not. You can almost see the Commissioners thinking, if we can just wait the Council out, then we won’t have to allow a levy for another two years, if at all! How inspiring. The WAJR morning show hosts, under the orders of their One Percent bosses, can whine and moan all they want about Morgantown City Council rushing – valiantly – to do what should have been done decades ago, making up for lost time. City Council is only elected on two year terms. Five of the members are new and more forward-thinking than in years past, in general. They’ve had a lot to take in and a lot to learn, and they are beginning to see, some of them, how the city has been shafted for years. And they are beginning to see, some of them, the need for urgency in the moment. The hosts of the WAJR morning show don’t live in the city. Do they even live in the county? The state? Doesn’t one live in Pennsylvania? A former host lived in Preston County, let alone in the city of Morgantown. Does the other host even live in Monongalia County? And yet they sit there and blather as the One Percent’s judge and jury on the city of Morgantown because they don’t want the wealthy business community that they sing the praises of day in and day out to pay city property taxes or the levy taxes to support city infrastructure and services and planning that those businesses draw wealth off of in the first place. They don’t want their One Percent heroes’ property taxes to go toward making the many urban neighborhoods more livable than they would be otherwise. Let WVU and the wealthy businesses give their money now to Mylan Park! Let them be free to build their paradise apart! And let the people be free to wander the dilapidated parks. To hell with BOPARC and the urban neighborhoods! Where the people actually live. To hell with them. Hey, don’t move to fund BOPARC! Let Mylan Park thrive! Let WVU glisten! To hell with Morgantown. Who cares about those tens of thousands of people, and the many more all around the perimeter? Let the outrage and the scandal and the city and social decay continue. Let all the crowded people in their crowded conditions rot to the ground. Let the people pilgrimage to Mylan Park! To pay their respects. And their dues. That’s what the County Commissioners do. Everyone follow! And let them eat cake along the way. Let the people eat cake in their neighborhoods too. Give them cake, a few crumbs here and there. Because there is no bread. Not nearly enough bread for their communities. It went to Mylan Park. The loaves pass from one deep pocket to another. If you’re lucky, you can drive to Mylan’s Park, the One Percent Park, or pay a bus pass for the tedious ride there, and then you can pay to get in. That’s how you make Morgantown poor.